This trading card game cross magical girl anime returns for a second season of card battles and emotional drama with a tighter, more focussed storyline and distinctly less whinging. 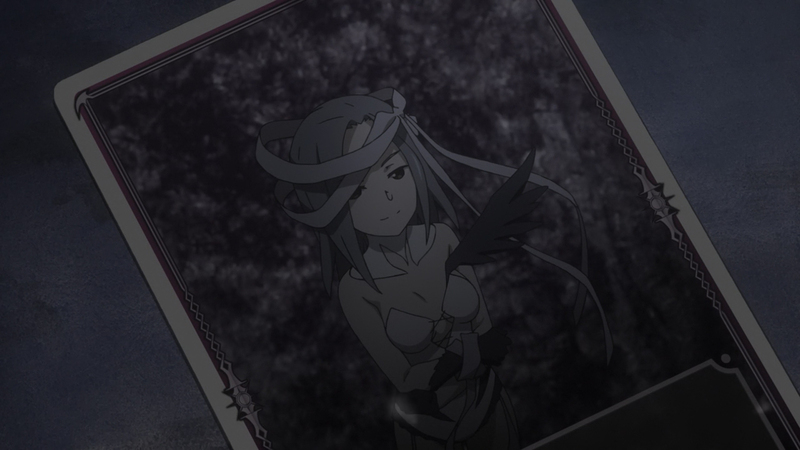 With Ruuko’s wish remaining unfulfilled, she is left after the battle at the end of selector Infected WIXOSS coming to terms with the loss Tama; with her and her friends seemingly determined not to battle now they know the truth behind the LRIGs, the girls trapped inside WIXOSS cards and forced to battle to fulfil their owner’s wish. However, with the inevitable return of Tama in the hands of an old enemy and a mysterious legend that links the birth of an Eternal Girl with an image of a white room, Ruuko is pulled into a battle for the ultimate realisation of her wish: to release all LRIGs from their cards. If you were expecting more of the same from this second season of WIXOSS, you’ll be slightly surprised, as spread takes a different track in having a greater distinction between the human drama and the card battles, with the latter pushed backwards as a plot device. While not completely ignored, it falls by the wayside as attention turns to the girls trapped within the cards and the mythology surrounding the game. It feels as if we have a greater sense of purpose, which in turn helps to drive the plot forward. There’s a distinct line of progression that moves forward at a good pace; something that infected failed on with its meandering through Ruuko’s uncertainty. All of that is gone and we have been left with a set of stronger characters. Ruuko in particular takes strides forwards, progressing from a whiny kid to someone who has the strength to free another of their burdens. This is a relief when the world seemingly revolves around her, with many of the other characters feeling trapped in a closed circle that only relate to each other because of the relationship between Ruuko and the LRIGs. Iona, after seeing her wish fulfilled to be the LRIG of the most powerful WIXOSS player, is now Ruuko’s LRIG, and they both attract the former LRIG Ulith, who is now in Iona’s body. The rest of the characters only serve to act as a binding agent for these three, or to fulfil the objective of sending Ruuko down the correct path. For example, new addition Chiyori is designed to show Ruuko the true joy of playing WIXOSS, despite her lack of skill, while light novelist Fumio Futase holds the key to confirming the existence of the white room and Mayu, the mysterious girl who inhabits it. The main issue is that each of the secondary characters feels disposable; after their part has been played they mean nothing to the viewer, something that affects how you interact emotionally with them. It’s also a shame that some of the excellent characters from the first season hardly get any screen time, like Ruuko’s grandmother who regularly entertained us with her excellent skill at the card game. It’s still quite a dark-themed series, dealing with thoughts of existence, psychotic revenge and even child abuse, and it’s interesting how these themes are used to bring damaged individuals together. Akira’s personality disorder develops into a dependant love of Ulith, and we see the creation of the WIXOSS card game as a form of escapism from a lonely, imprisoned reality. It’s these themes that truly hold your attention, for without them there would be little motive for any of the girls to wish for anything. It’s the same kind of drama that Puella Magi Madoka Magica went for; and even though such dark themes have become overused in the industry since the Madoka popularity boom it can still be successful when pulled together in the right way. And this time around with its tighter plotline, WIXOSS hits the mark. Sadly, this doesn’t get past some of the glaring plot holes, which while they don’t wreck the show, it leaves a missing piece of our understanding of the series. 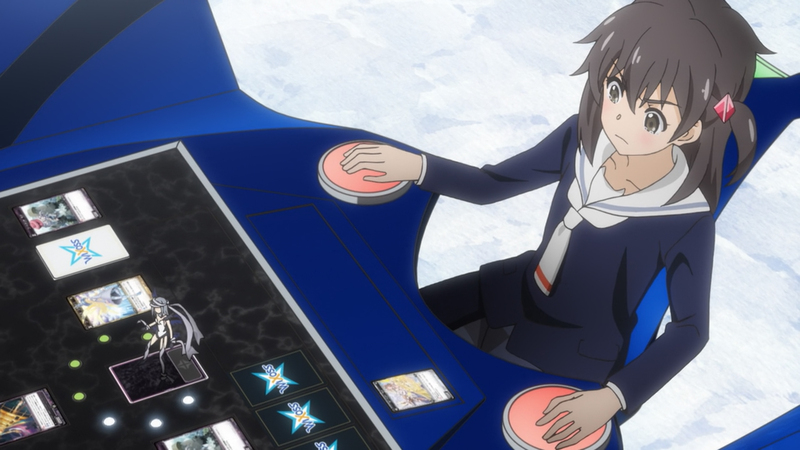 The most glaring emissions is how the WIXOSS game emerged from a girl’s imagination into the real world, as while we do get the background into the game, we never get an explanation of the former. Some of the laws of the WIXOSS game are also either left out altogether or not fleshed out enough, especially with the conditions that need to be fulfilled to become an Eternal Girl, which seems a completely random process. Visuals remain largely unchanged from the first season, with the moe styling and muted colour palettes. There’s an interesting contrast made with the white room, placing Mayu as some sort of deity as the game’s creator with the colour of purity. It also plays host to some good environment destruction work as the room breaks up into cubes in a climactic battle. The audio and soundtrack remains consistent from the first season, reaming quite sombre and atmospheric, but picking up the pace when it needs to. The voice work is a mixture of good quality, particularly when showing the madness of Akira and the downright evil of Ulith; and annoyance, particularly with Tama’s high-pitched, screeching disjointed speech, which in this second series surpasses Ruuko’s whining as the most annoying character voice. 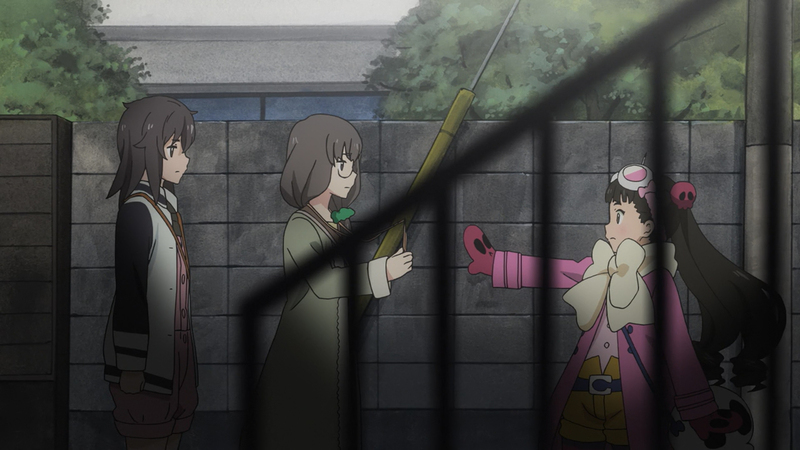 With a balance that pushes the card battles into the background, it is evident that selector spread WIXOSS works best as a drama series, peering into the lives and emotions of the fragile young girls who would do anything to see their wishes granted. The card game is only a means to an end and a portal into a fantasy alternate world; and if you are looking into this because of the card game then you are looking in the wrong direction. That said, despite the plot holes and character abandonment this is a solid but safe series designed to entertain the typical anime viewer.